* We proudly introduce a new La-Brasiliana treatment. When an appointment is booked, the time is reserved for you. For certain types of appointments, we may require a deposit and/or a credit card on file to secure the appointment. It for any reason you need to change, please rescheduled or cancel an appointment booked. Let us know so that we may make the time slot available for others. If you fail to cancel your appointment prior to 24 hours before your scheduled appointment time, we reserve the right to charge you 50% of the full price of the service(s) reserved. 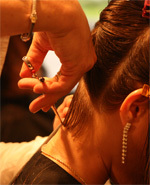 We also reserve the right to require a credit card to be on file for booking future appointments. Thanks so much for your cooperation and understanding in advance! * Prices slightly higher for long hair.